From the #1 New York Times bestselling author ofAnathem, Reamde, and Cryptonomicon comes an exciting and thought-provoking science fiction epica grand story of annihilation and survival spanning five thousand years.What would happen if the world were ending?A catastrophic event renders the earth a ticking time bomb. In a feverish race against the inevitable, nations around the globe band together … to devise an ambitious plan to ensure the survival of humanity far beyond our atmosphere, in outer space.But the complexities and unpredictability of human nature coupled with unforeseen challenges and dangers threaten the intrepid pioneers, until only a handful of survivors remain . . .Five thousand years later, their progenyseven distinct races now three billion strongembark on yet another audacious journey into the unknown . . . to an alien world utterly transformed by cataclysm and time: Earth.A writer of dazzling genius and imaginative vision, Neal Stephenson combines science, philosophy, technology, psychology, and literature in a magnificent work of speculative fiction that offers a portrait of a future that is both extraordinary and eerily recognizable. 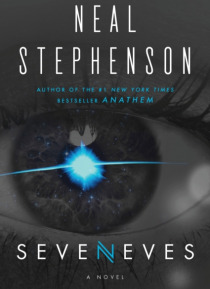 As he did in Anathem, Cryptonomicon, the Baroque Cycle, and Reamde, Stephenson explores some of our biggest ideas and perplexing challenges in a breathtaking saga that is daring, engrossing, and altogether brilliant.